Hello and welcome to another Tutorial Tuesday from The Digital Press! I don’t know about you, but I love, love, love all the pretty, swirly, quirky, office-y, bold, simple and all other kinds of fonts that are around (and often free!) in digiland. I have to admit I have bunches of them that I loved the look of, and downloaded, but have never used because I tend to stick with a few old favourites. Are you a bit like me? Well this tutorial is all about how to mix, or combine fonts – in the hope that perhaps you and I will go on to use a few more of the pretty fonts that we have stashed away, gathering digital dust in on their virtual shelves! There are no hard and fast rules when it comes to combining fonts, just like everything else, if it looks good to you, then it is good! But there are a few guidelines to help if you want to mix and match your fonts. Serif — these fonts have little lines at the end of each stroke (so at the beginning and end of the s, at the top and the bottom of i etc). Sans serif — these fonts DON’T have those little lines at the end of each stroke! 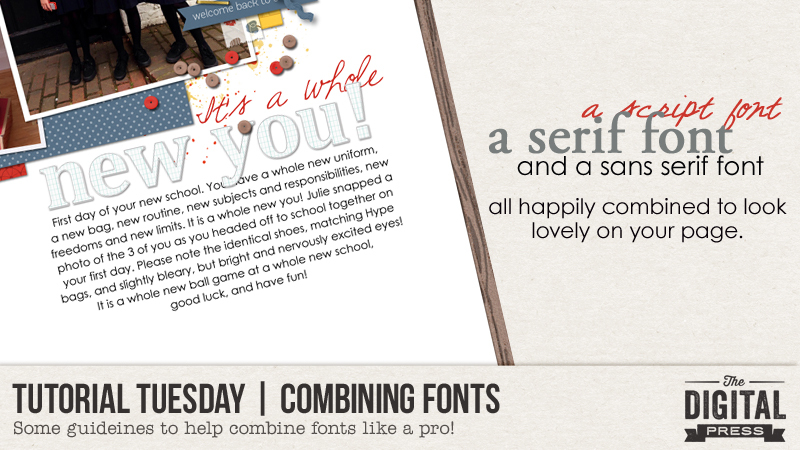 (The font you are reading right now, the main text of this tutorial, is written with in a sans serif font). Script — these fonts are based on handwriting, and tend to look more casual than the serif and sans serif fonts. Different fonts can help to create a different character for your pages, and when used well, they can give you a brilliant title, inviting journaling and clear notation of the facts (like when and where your event occurred). 1. 2 could be the magic number! Most pages can be improved by using more than one font, but few pages will be improved by using more than 3. 2. Contrast is key! When combining fonts, try looking for fonts that have plenty of contrast. For example, if you have used a tall and thin sans serif font, try pairing it with a shorter or rounder scripty font. 3. Size matters! Pay attention to the size of your fonts. If you are creating a title, you might want to have one focus word bigger than the rest. Titles are also usually larger than the main body of journaling. When thinking about your journaling font, remember that some fonts are easy to read even when they are quite small (serif, or sans serif fonts for example), while some fonts can be quite difficult to read if they are small (script fonts tend to be more difficult to read in small sizes). You can try adjusting the font size, or the spaces between the lines (called leading), or even the space between each letter (called kerning). So, putting all these guidlelines to work, I made this page! You can see that I went for 3 fonts (2 in the title, and 1 for the journaling and date). I used a script font (“Sunshine in my soul” – seen in red) and a serif font (this is actually an alpha from Project Grateful – Crisp, which is the collection I used to make my layout) for the title, and then I stuck with a popular and easy to read sans serif font (“Century Gothic”) for the journaling and date. So there you have it! I hope you have found this helpful, and if you know you have some great fonts, but haven’t used them much yet because you need a little help organising your fonts, Carolyn (Amson) recently wrote a blog post all about a way to help organise your fonts so they are easily accessible next time you want to try using some of them! That tutorial can be found here: Easy Font Management. About the Author Corrin is on the creative team here at The Digital Press. She is a fan of the Big Bang Theory and a lover of cozy pajamas. She lives in the breezy South of England with her husband and 4 crazy kids, who regularly discover & plunder her secret chocolate stashes! She is still trying to get the house straight after moving nearly 3 years ago. Who knows… maybe this will be the year she reaches the bottom of the laundry pile!